Red belly piranhas require specialized care in a home aquarium. This extends to their living environment, which needs to accommodate their larger size. Many people find the idea of keeping piranhas novel enough to provide for their specialized needs. You will need a large aquarium to house red belly piranhas, since they can grow to a foot or more in length. On top of this, red belly piranhas school in the wild for protection and need to be in groups of six fish or so to feel save. A group of juveniles can survive together in a 50-gallon aquarium. However, as adults, you will need an aquarium with at least 15 to 20 gallons of aquarium volume per fish to accommodate their size. Since these piranhas come from the Amazon drainage, they prefer tropical, soft, acidic water. You need to keep their water between 75 and 79 degrees Fahrenheit -- and as soft as possible -- for them the thrive. The pH should remain between 6 and 7. You can achieve these conditions with water purified through reverse osmosis. Red belly piranha, despite their larger size, have similar decor to smaller tetras. A piranha aquarium needs both dense thickets of aquarium plants to make the fish feel safe, and open areas for them to cruise. You can also add some Malaysian driftwood to help maintain a low water pH like the waters of their natural habitat. Make sure you have hiding places, since piranhas may get aggressive with each other, and hiding places provide needed respite for lower-ranking fish. The prospects of tank mates for red belly piranhas is dicey at best. Beyond a school of their own kind, you have few options. Some closely related piranhas may school together. However, make sure you have as big a tank as possible to limit the consequences of violence. Even moderate aggression is dangerous in a fish with razor-sharp teeth. Some aquarium hobbyists have had luck with plecos, since these catfish are all but armored. 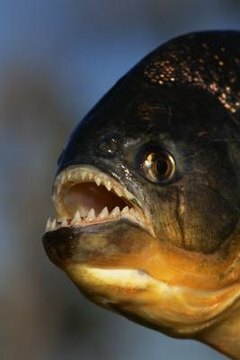 Additionally, some large piranhas sometimes ignore very small fish, which seem to fall below their radar. However, any fish you put into an aquarium with piranhas is at risk of being eaten, so keep that in mind if you want to try.